Omaha: Need I say anything? Are we ready for some (more) football? This is the week it all comes together — at Super Bowl XLVIII, the February 2 showdown between the two teams left standing after six months of weekly clashes among 32 teams split into two conferences (American and National Football Conference), each containing four divisions (North, South, East and West). This year’s contest pits the Denver Broncos against the Seattle Seahawks. Fans in Mississippi, Tennessee and Louisiana (and the entire SEC) are celebrating already, for we have a Manning on the field again. Record-breaking Denver Broncos Quarterback #18 Peyton Manning hails from our esteemed Mississippi-Louisiana first family of football. But Magnolia Staters have even more to celebrate. The Broncos roster boasts Tackle Chris Clark, #75, from Southern Miss. The Seattle Seahawks’ roster includes KJ Wright, active Linebacker #50, from MS State. Since I’m from Memphis, the unofficial second capitol of the Magnolia State, I’m also mentioning Defensive Tackle #69, Clinton McDonald, from the U of Memphis. The Seahawks’ practice squad includes Defensive Tackle #90, Dewayne Cherrington, and Wide Receiver #14, Arceto Clark, both from MS State. WAIT WAIT. THERE’S MORE. Super Bowl XLVIII also boasts a Mississippi officiating back judge — Oxford’s own Steve Freeman. For an hilarious analysis of college football stats related to the 2014 matchup, check out Jason Kirk’s blog “SBNation”. The SEC definitely leads both packs of this year’s Super Bowl players. One never knows what’s gonna happen on the field during a Super Bowl. That’s half the fun of watching, isn’t it? Folks, I was there the year of the wardrobe malfunction. It was a wild moment in football history, on the field and off. My armchair friends back home got a bigger eyeful than we did in the stadium stands. And their finger foods were still warm. At any rate, unless Snowmageddon 2014 hits MetLife Stadium, or the GW Bridge is closed down again for “repairs,” Super Bowl XLVIII promises to be a gridiron matchup for the ages. We don’t want to miss a single moment — from opera superstar Renée Fleming’s correctly sung kickoff rendition of the Star Spangled Banner, to those mishaps, actual football plays, special television commercials, Bruno Mars half-time entertainment, and unscripted post-game player rants. After all, the Super Bowl is our national religious ode to American free enterprise and commercialism… qualities that helped to make our nation great. We armchair quarterbacks need to be ready for it by planning and preparing our game-day foods in advance. The best Super Bowl food and drink recipes tend to have two overriding characteristics: (1) Eating and drinking them can be accomplished with minimal fuss. (2) They must be spicy hot to keep us warm and awake, even when viewing the game from the toasty bleachers in our own homes. The Old Bride’s preferred Super Bowl fare consists of chili, with pico de gallo, southwest cornbread, and beer. Well, the Hotty Toddy nation has been there, done that. 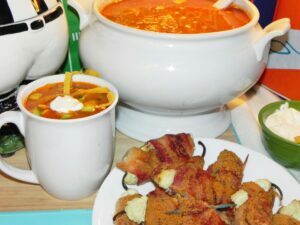 So this year I’m sharing tortilla soup with bacon-wrapped jalapeño poppers and nachos extreme. Make no mistake, there’s a definite Olé theme at work here, designed to warm up even the coldest pipes in town. Maybe next year, if it’s warmer, we’ll do Italian. Feel free to simmer this soup ahead and reheat it for your Super Bowl party. The flavors will merge after 24 hours in the fridge. It works as well served in mugs with disposable plastic spoons as it does in real crockery with silver flatware. Sauté onion, garlic, jalapeño and bell pepper in olive oil until soft. Combine with next 11 ingredients in a large (8 qt or larger) stockpot and bring to a boil. Remove chicken breasts after about 45 minutes and shred or chop. Add beans and corn and simmer about 10 minutes before adding chopped chicken. Simmer additional 45 minutes. Ladle soup into bowls and top with chopped avocado, toasted tortilla strips and chopped cilantro. Add Mexican Fiesta blend cheese, sour cream and chopped green onion for garnish. TO MAKE TOASTED TORTILLA STRIPS: Cut stale tortilla into quarter-inch strips. Fry in hot cooking oil until crispy but not over-browned. Drain on paper towel. Choose peppers about 3 to 3-1/4 inches long. Membranes and seeds are very hot, so remove them for milder flavor. Serve with margaritas or Mexican beer with lime wedges. Preheat outdoor grill or stovetop grill, or preheat oven to 425˚F. Prepare jalapeño peppers by cutting in half length-wise, including the stem in each half, and using paring knife and a small spoon to scoop out membrane and seeds. Blend cream cheese and ranch dressing mix with mixer until spreadable. Fill a quart-size freezer bag with the cream cheese mixture and transform it into a pastry bag by snipping one corner. Pipe the cream cheese mixture into all 12 jalapeño halves (do not overfill). 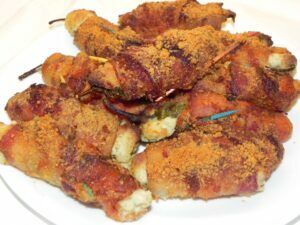 Wrap each stuffed pepper half with a piece of bacon, starting with one end underneath at fattest end of the pepper, and tuck the ends underneath, securing with toothpicks. After stuffing and wrapping the peppers, roll each to coat in a bag containing grated Parmesan cheese. Place coated, stuffed peppers on grill or on oven broiler rack in a pan containing about 1/4 inch of water. Grill or bake until bacon turns crispy, about 15-20 minutes. 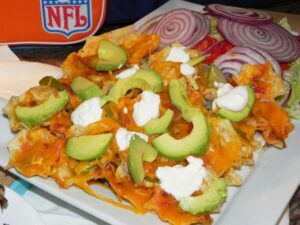 Nachos are perhaps the favorite American finger food for all armchair sports viewing, in part, because just about anything edible can be baked on a pan full of crisp tortillas. Southern gas stations and high school football stadiums serve “nachos” consisting of Tostitos drizzled with melted, Rotel-infused Velveeta. But a great plate of nachos is best served direct from the oven, layered with sizzling fresh cheese and other condiments. Add-ons such as lettuce and fresh tomatoes should be the individual’s choice. Fresh guacamole should be served on the side, or dolloped on top. Arrange the shredded lettuce in a large serving platter. Layer the tomatoes and red onion slices over the lettuce. Squeeze the juice of one lime evenly over the salad. Line a cookie sheet or large baking pan with aluminum foil. Spray lightly with nonstick cooking spray. Spread Tostitos evenly in the pan. Sprinkle small dabs of chili evenly over the Tostitos. Layer with Fiesta-Blend cheese and a few slices of pickled jalapeño over the chili layer. Use a teaspoon to sprinkle salsa casera liberally over the cheese layer, making sure to get little dabs about every half inch. Sprinkle about a cup of grated cheddar over this. Top with chopped green onions. Bake about 10 minutes in oven preheated to 425˚F until the cheese has melted and begun to bubble. Remove from oven. Wearing oven mitts, lift the foil from the pan, and using large metal spatula, slide entire baked goody onto the layered lettuce and tomato salad. Top with slices of avocado and about 4 dollops of sour cream. Serve immediately. Diners will need forks for the salad component.